First United Methodist Church works in conjunction with several other churches, and our local Wal-Mart, to ensure that all Skiatook children have gifts for Christmas morning. Our missions team, led by Sheril Lewis, and Office Administrator, Ka'Lu Underwood, spend hours collecting applications, making angels with the gift requests, and distributing them throughout the community. Gifts are collected, organized, bagged and distributed to the various families who seek assistance. FUMC Skiatook is the guarantor of any angels who do not get "adopted", and a weekend of shopping follows to make sure each child has a memorable Christmas. 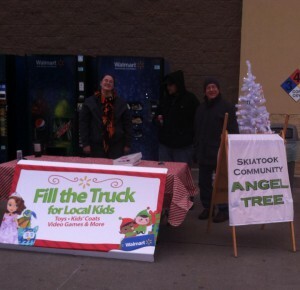 This past year, we spent a day at Wal-Mart collecting toys and gifts from very generous community members, in a "Fill the Truck" campaign. We are very grateful to WalMart for their help, and the generous community support we receive. 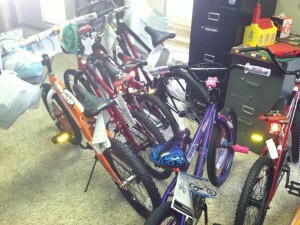 We were able to provide gifts for over 300 children last year. We were also the recipients of gifts from two different motorcycle "toy runs". Thank you all! Angel Tree Registrations for 2017 run from Oct. 10-Nov. 2. We will accept registrations each Tuesday and Thursday from 10-noon; and again from 4-6 pm. Please bring a photo ID and proof of income. Gift pickup is on December 16, from 10 a.m.--3 p.m.